New fresh food franchise in town! 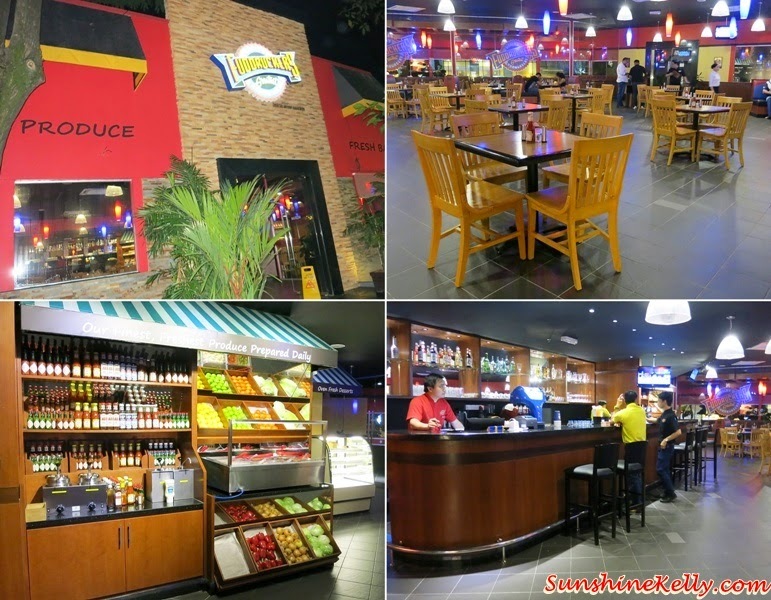 Fuddruckers, an American Casual Dining restaurant now opened its first outlet in Lot 10, Bukit Bintang, Kuala Lumpur. This is the new addition to Malaysia’s growing restaurant scene is all about fresh food and natural ingredients. 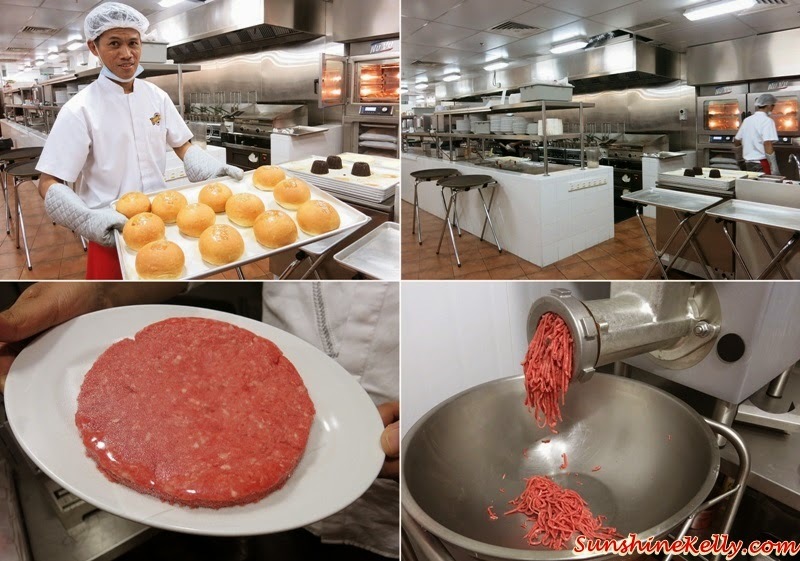 There are well-known for their black Angus beef and freshly baked buns twice daily. The signature dish is Fuddruckers The Works charbroiled beef burger, daily fresh in-house made black angus beef patty and freshly bake bun. Have you try that? The beef is supposed to melt in your mouth… waa! Fuddruckers is founded by Philip J. Romano and now they have almost 40 outlets in Middle East. 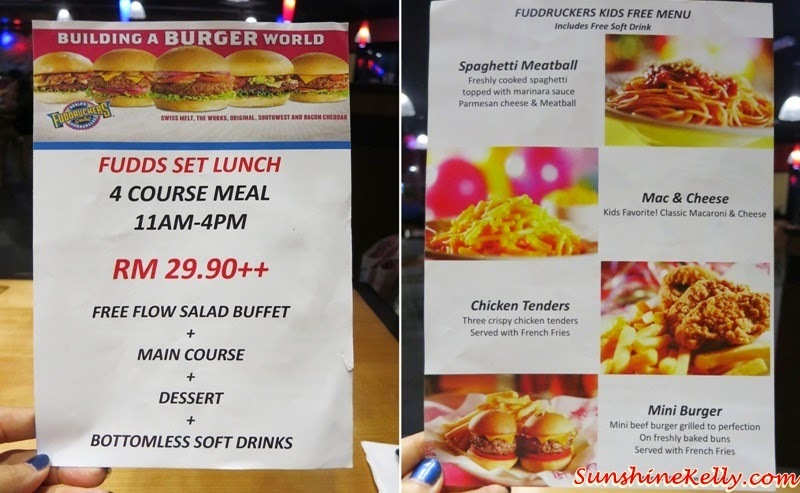 We visited Fuddruckers few weekends ago and tried some of the dishes. This platter is good for sharing. I love the crispy mozzarella chesse stick dipped in the honey mustard sauce. It’s so cheesy! Chilli cheese fries, crispy mozzarella cheese sticks, buffalo chicken wings, pizzaiola quesadilla, onion rings, carrots and cucumber sticks served with cool honey mustard and creamy ranch dippings. The combination is perfect, bit of tangy and sweet, crunch and filling. However, the chicken breast meat is slightly dry for me. Mixed lettuce, tri-color tortillas, pico de gallo, diced tomatoes and pineapple slices tossed with honey mustard dressing. Topped with marinated charbroiled chicken breast meat and served with Texas toast. My favourite fresh succulent well marinated sauteed shrimp. This seasoned grilled fish fillet and sautéed shrimp served with aioli sauce, steamed vegetables and a choice of baked potato, mashed potato, sweet corn, Fudds Fries or French Fries) plus Texas toast. The chicken sandwich is moderate, I bet their beef hamburgers are better. Marinated charbroiled chicken breast, cheddar cheese, hickory smoked beef bacon, sautéed mushroom served with mixed lettuce, sliced tomatoes and chipotle honey mustard dressing on a freshly baked bun. The black angus bone-in rib eye steak melt in the mouth. Soft, juicy and savoury. It says this is a steak lovers’ steak. 396 grams well-marbled charbroiled bone-in steak (cooked to order) and seasoned with Fudds signature spices. A blend of banana and caramel sauce smoothies, it’s creamy and satisfying not too sweet. Banana lovers will love this. Candylicious! Love the sweet scent of candy. I love the Salad Bar and Sauce Shop, it is a good concept. I can scoop and have my free flow my favourite salad. Unlimited! They have quite good selections of salad like fresh garden salad, potato salad, coleslaw, salsas. I lost count of the types of sauces available there but the four types people like are the jalapeno cheese, cheddar cheese, mustard and bbq sauce. Since Fuddruckers emphasis on the freshness of their food, they also allowed me to visit their kitchen and butchery. All their buns, cakes and cookies are freshly baked daily at their in house kitchen. There is no central kitchen to process the food and delivery to the restaurant. They use black angus beef are imported from Australia. All the hamburgers patties are freshly made every day at their in house butchery. The on-going promotion at Fuddruckers is the FUDDS Set Lunch Set, whereby 4 courses meal for only RM29.90++ from 11am to 4pm. You get free flow salad buffet, 1 main course, 1 dessert and 1 bottomless soft drink. For main course you can choose either one of these burgers or sandwiches - The Works, Cowboy Burger, Hot Rocks, Swiss Melt, Southwest, Cajun Chicken, Santa Fe Chicken, Lemon & Pepper, Grilled Works or Crispy Buffalo. Kids Eat For Free include 1 main course (kid's portion and 1 soft drink), the selection are Spaghetti Meatballs, Mac & Cheese, Chicken Tenders and Mini Burger. Overall, the food are fresh, lightly flavored which is good so that I can taste the original taste and healthy. The food price is quite reasonable especially the FUDDS set lunch and also kids eat for free. To me the specialties about Fuddruckers are that we get a free flow of salads at the salad bar, customize our own burger’s toppings and also there are so many choices of sauce. According to Kamal Amir, General Manager, AAR Fusion Industries, there are about 10,400 combinations of hamburgers at Fuddruckers.